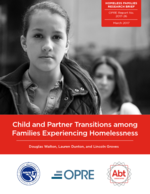 New analysis of data from HUD's Family Options Study finds that about 30 percent of sheltered homeless families reported a separation from at least one family member. Family transitions continued in the following 20 months, with 10 percent of families experiencing new child separations and 8 percent reporting reunification with children who had not been with the family in shelter. Formal out-of-home placements were rare for children while families stayed in emergency shelter but grew over time. In addition, separation from children while in emergency shelter was associated with continued housing instability in the 20 months following a shelter stay, and continued housing instability after an initial shelter stay was associated with child separations as of 20 months later.